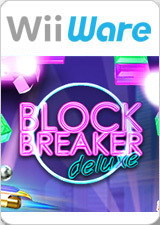 Block Breaker Deluxe is a reinvention of the classic arcade brick-breaker game with a trendy graphical style, fun atmosphere and an exclusive multiplayer mode. Lively characters and amazing graphics provide distinctive settings of the jet-set nightlife, including a cool bar, dance club, casino and more. Special bricks, multiple bonuses, secret weapons, paddle size options and ball-speed variations make this fascinating game even more challenging. The Block Breaker Deluxe rage has arrived. The graph below charts the compatibility with Block Breaker Deluxe since Dolphin's 2.0 release, listing revisions only where a compatibility change occurred. 3.0-878 Windows XP AMD Athlon II x2 215 @ 3.56GHz NVIDIA GeForce GT 440 Complete 10 levels. All time at 100% of speed. Minor bugs with sound (DSP-HLE) - some audio samples (usually violin sample) get stucked and played loud & for long time - 1-3 seconds or before level completed (music changed). †.fl.l). This page was last edited on 8 January 2018, at 09:47.